Lines of Action is the original connection game. The players start with their pieces in two groups on opposite sides of the board, with the goal of uniting all the pieces into one group. The pieces must always move exactly as many spaces as there are pieces of either color anywhere along the line of movement. 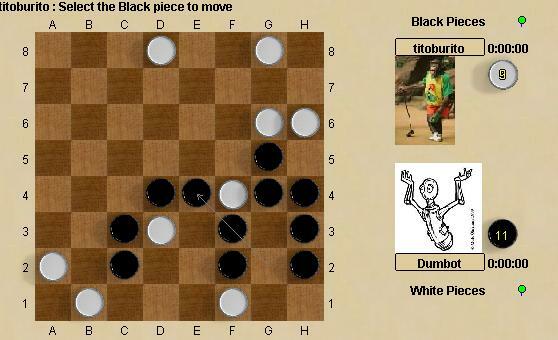 These rules define a very chess-like game nicely balanced between strategy and tactics. As a fairly old and relatively well known game, there are many variations of LOA, and one unique variation called LOAPS is played here. LOAPS was originally developed as challenge for a programming contest. Robots: The LOA robots at boardspace are beatable, but not easily. The back story: Lines of action ought to have been the first game at Boardspace. I wrote my first LOA program 30 years ago, and it has been a pet project of mine since the earliest days of the internet. Somehow though, it was always "maybe next year" when I contemplated the big effort to go from nothing to something. So when I finally did have the server running, LOA was already in the queue.